Often clients need a really flexible product sorting to find the product they need. 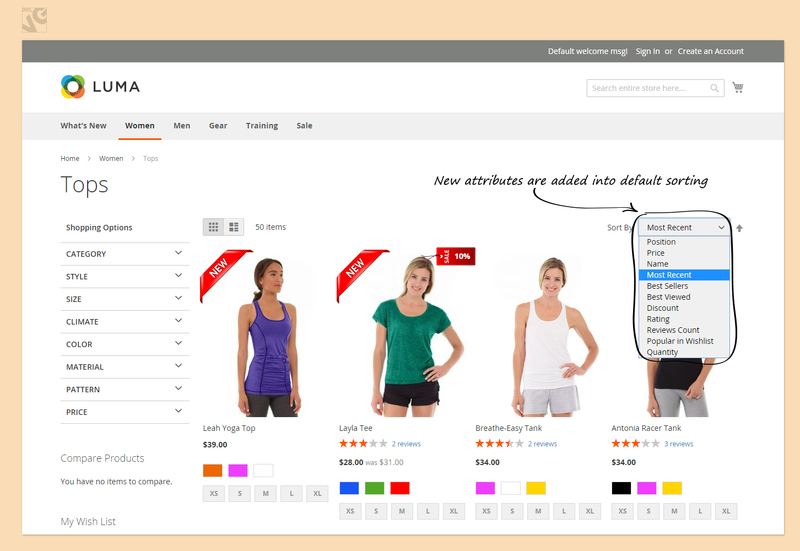 But the default Magento includes only Sorting by Position (set for the category) and by attributes. These criteria are not enough to let users find the products they need. The more criteria for search users see, the more confident they feel and the better experience they have on your store. Improve user experience and let your customers enjoy product sorting! In the latest version you will find more popular non-standard sorting features and it is compatible with Magento 2.0. In order to configure this extension, navigate to Stores => Configuration. Then select “Product Sorting” under “BelVG Extensions”. Enabled For Frontend (Yes / No) – this option enables or disables the extension for the Frontend. Current store has the following sorting criteria available – here you can manage the name, order, and disable or enable sorting criteria. Code – it’s the name of the criteria for internal use. If you would like to change the name of criteria that will be displayed on your store, you can do it in the “Label” column. Order – in this column you can define the order in which the criteria will be displayed in the Sorting on Frontend. Enter the numbers to change the order. 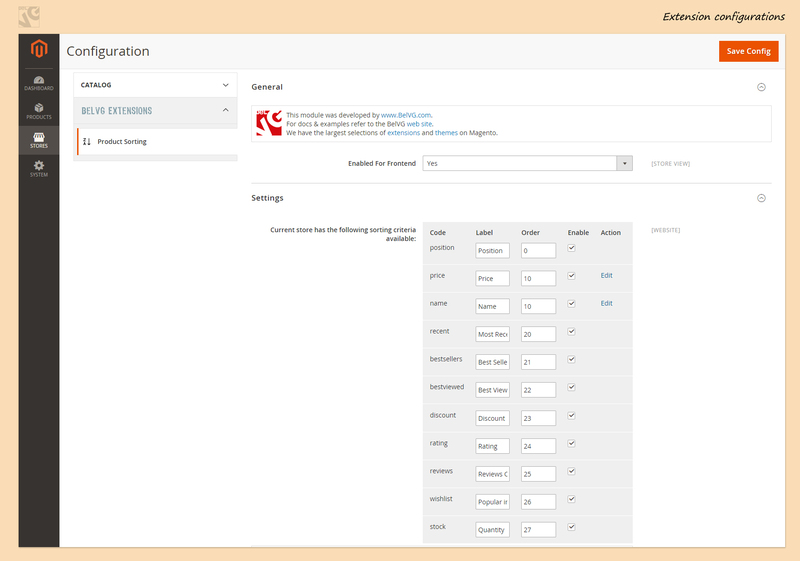 Enable – here you can enable or disable sorting criteria by selecting or unselecting the checkbox. Images priority – select “yes” if you want products with images to have higher priority in sorting. Products in stock priority – select “yes” if you want products available in stock to have higher priority in sorting. Apply the ‘New from Date’ – ‘New to Date’ attributes for the ‘recent’ sorting – for products that are defined as new, the sorting is applied not by the date of their actual creation, but by the date that is defined in the “New From / To Date” section. Discount – define whether you want the “discount” criteria to sort products by the percent or by the actual amount of discount. Periods – define the periods for which the products are “Best Sellers”, “Best Viewed” and “Popular in Wishlist”. All the product sortings that you selected in the admin are available on the catalog page.